Announcements #149: New OU Kosher DVD: What’s Wrong With This Chicken? 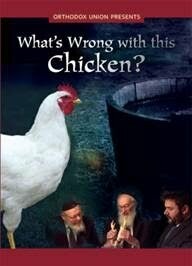 New OU Kosher DVD Explains: "What’s Wrong With This Chicken?" Ham? Non-kosher. Shrimp? Non-kosher. Chicken? Kosher. Chicken with a dislocated femur…non-kosher??? An aspect of home kashrut not so well-known is the avoidance of traifos. Despite its colloquial usage to mean “non-kosher,” a traifa is actually a bird or quadruped with a certain type of bodily defect that renders it non-kosher even when slaughtered correctly! In OU Kosher’s new video, Harav Yisroel Belsky, Rosh Yeshiva, Yeshiva Torah Vodaath, and OU Kosher Halachic Consultant is joined by two OU rabbinic coordinators with vast expertise in the certification of meat and poultry, Rav Nosson Goldberg and Rabbi Chaim Loike. Together, they elucidate in a clear and thorough fashion the red flags in raw chicken that YOU need to know. After watching this video, you’ll have more confidence in the kashrut of the meat you serve. Note to Educators: In this video, Rav Belsky masterfully weaves together anatomy and physiology with the halachot of kashrut. It is invaluable for a yeshiva biology teacher—especially one who wants to stress that the laws of the Torah and the laws of nature have One Author! “What’s Wrong with this Chicken?” is one of several projects of OU Kosher’s expanded educational outreach. OU Kosher’s educational programs include the ever-popular “OU Kosher Coming” program, which sends OU’s expert rabbis to schools, synagogues and college campuses to share their knowledge of halacha and technology; as well as the ever-growing “Kosher Tidbits” series of short seminars on innumerable aspects of kashrut and certification, available at ouradio.org. Over 150 Kosher Tidbits are now posted. The Orthodox Union has produced five other of DVD’s devoted to kashrut education, which includes: “Kosher Kidz,” which conveys the basics of kosher certification to a youthful audience; “The Kosher Fish Primer,” which explains the basics of identifying kosher fish and purchasing them; “Kosher Meat: Unexplored Frontiers with Rabbi Yisroel Belsky,” which describes the laws and biology of kosher meat preparation; “Kosher Birds: Who Are They,” a guide to the indicants of avian kashrut; and “Insect-Free: A Guide to Home Vegetable Inspection.” These DVDs have been purchased and used in Jewish schools and communities throughout the world including Israel, Australia, England and Latin America. The new chicken DVD is available @ $10 per copy; to order all 6 OU Kosher DVDs the cost is $40. For further information contact safrane@ou.org.